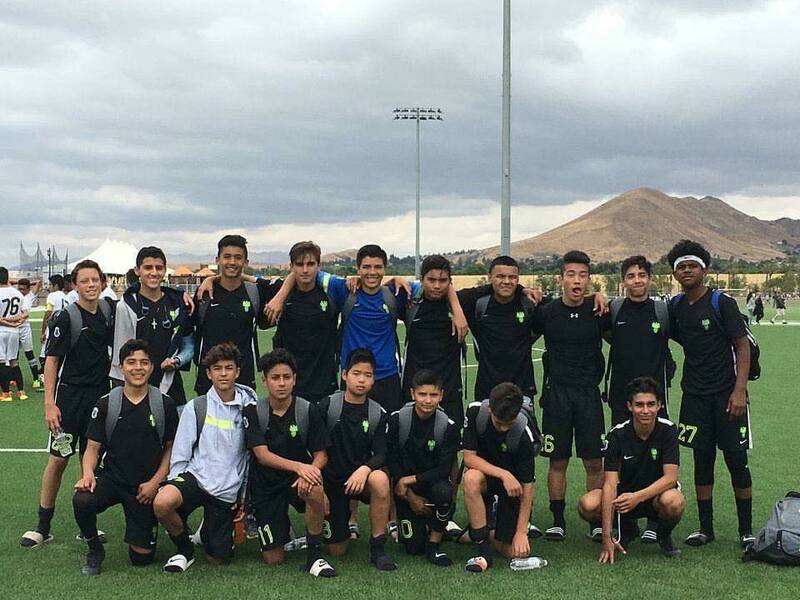 Congratulations to Freedom FC B02 Blue for having a successful weekend at the Players Showcase in Vegas. The boys finished second in their bracket of eight and had some great results, one of which was a tie with the Louisiana ODP team. Having the most difficult schedule out of Flight 1, the boys went into the semi's as the 3rd seed with no losses. The team came together on and off the field playing its best soccer of the season. We played some great teams and had a wonderful experience. In the end, after five games and three days of soccer, the boys took the championships with a 3-0 win. Blistering heat on turf the first day and even hotter temps 2nd, Freedom B02 went undefeated, shut out every team, and took home the Championship for our first tournament. The team scored 11 goals over the period of two days and didnt allow any. There was a Van Persieing header, some crossbars, spectacular long goals, and beautiful crosses. The back line held, and the team just played beautiful soccer. Great way to start the season. With sheer determination and playing with a team of sick kids (our boys had to rotate games because they were so ill) in the Top Flight Marco's B02's played a Gold Long Beach FC in the Semi's beating them 1-0. Several hours later they come back to play a very tough Pateadores MV (Flight 1) team in the finals. Freedom draws first blood by scoring first in the first 10 mins. only for the opponent to respond with the same before the half. Coach Marco sat the boys down, pumped up the boys, drew a game plan and executed. The boys came back strong scoring 3 more goals and taking the Championships 4-2. Looking forward to Las Vegas Cup next and State after. Losing the 1st game 0-2, the boys never gave up. They went on a 10-1 run for the next two games to get to the Championships. During the Championship they got to a quick start and scored within the first 5 mins. Controlling the game 98% of the time, the boys pulled through beating the same team they lost to 4-1. Great job and a great way to start the season. This one is for you Kody and the Barton Family!!!! Congrats to Coach Marco Rodriguez, Asst. Coach Ky Kugler and the Freedom FC B02 team for winning the Strikers Jr. Cup on July 14/15. The boys had an awesome run going undefeated scoring 19 goals in 4 games and shutting out the final opponent with a score of 6 - 0 in the Championship game. Aug 11/12 2012- Through lightning storms, mini tornadoes, and scorching 110 degree heat, the boys of Freedom FC B02 led by Marco Rodriguez with support from Ky Kugler did it again. The first day was only 106 degrees as they beat the first team 4 to 0. While waiting for the second game, lightning appeared over the horizon and they canceled the 2nd game. Solution for making up the missed game was PK’s the next day.